Wherever you are in Vietnam – from Saigon to Hanoi, from the Mekong Delta to the Red River, from the Central Highlands to the Northwest Mountains – you can always rely on one of two dishes to fill you up: cơm tấm and thịt kho tàu – broken rice and pork stew. 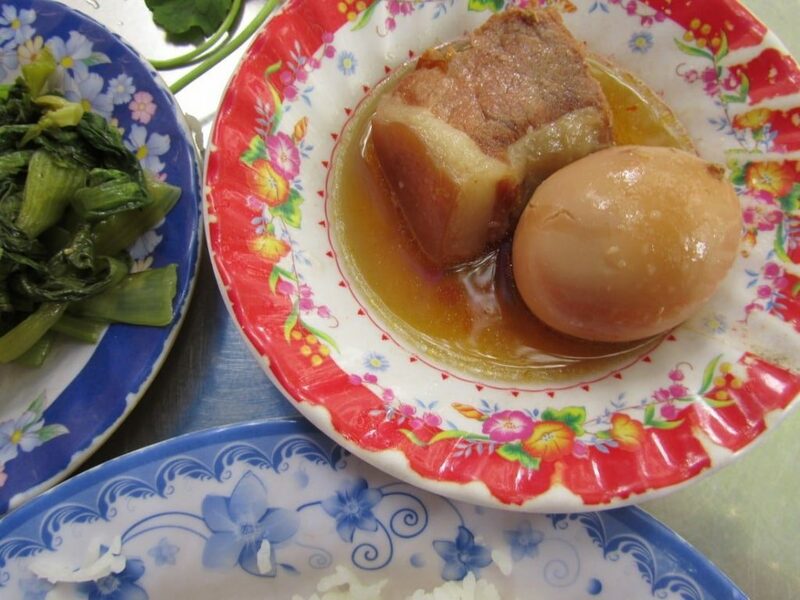 These two pork dishes are ubiquitous in Vietnam. Breakfast, lunch or dinner; they’re always available. Forget phở – the famous beef noodle soup – the real national dish of Vietnam is pork and rice. What is it? Vietnamese ‘Fry-up’! Cơm tấm means ‘broken rice’. During the process of harvesting and transporting rice the grains are often damaged. In the past, these fractured grains were difficult to sell because most people preferred to eat the long, whole grain rice. With their broken rice unsold farmers traditionally used it as animal feed. 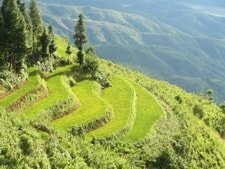 However, food is rarely wasted in Vietnam and at some point farmers and poor families (who could afford the broken grain because it was cheaper) began to cook it for their own consumption. Nowadays, broken rice is often favoured over long grain rice for its texture (something akin to couscous), and cơm tấm is one of the best-loved dishes in Vietnam. Popular at any time of day, but particularly in the mornings, Cơm tấm is Vietnam’s answer to the English breakfast ‘fry-up’. Steamed white broken rice is heaped onto a plate; sliced tomato and cucumber adorn the edges – a palate cleanser which also adds colour to the dish. 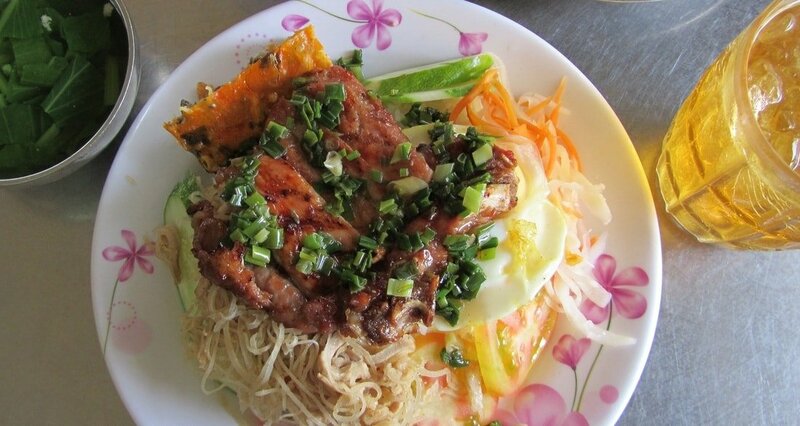 A grilled pork chop (sườn) marinated in fish sauce, spices and lemongrass is laid on top. 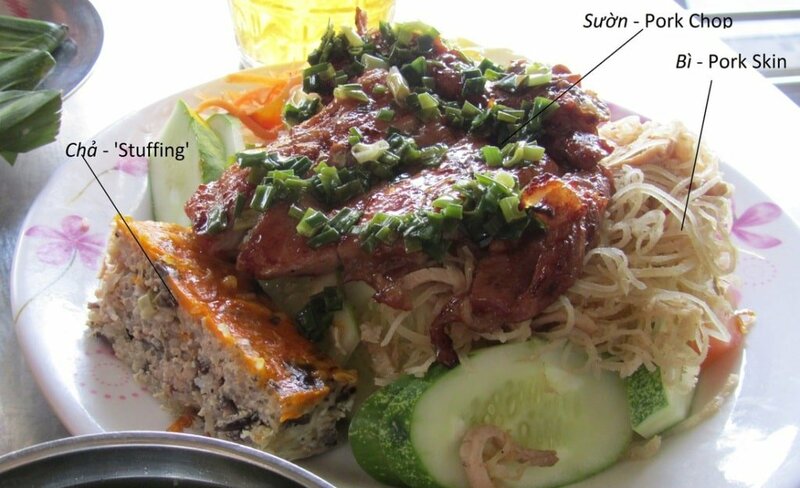 Next to the meat is chả – an egg, pork, mushroom and glass noodle ‘cake’ best described as ‘stuffing’. Also piled on top is bì – a mixture of shredded pork and pork skin which adds a slightly chewy texture. Finally, a fried egg, a drizzle of chopped spring onion in oil, and some pickled carrot and radish on the side. You’ll also be served a small, light, clear broth of meat-stock and spring onion to line the stomach. Where to eat? Follow the Smoke! 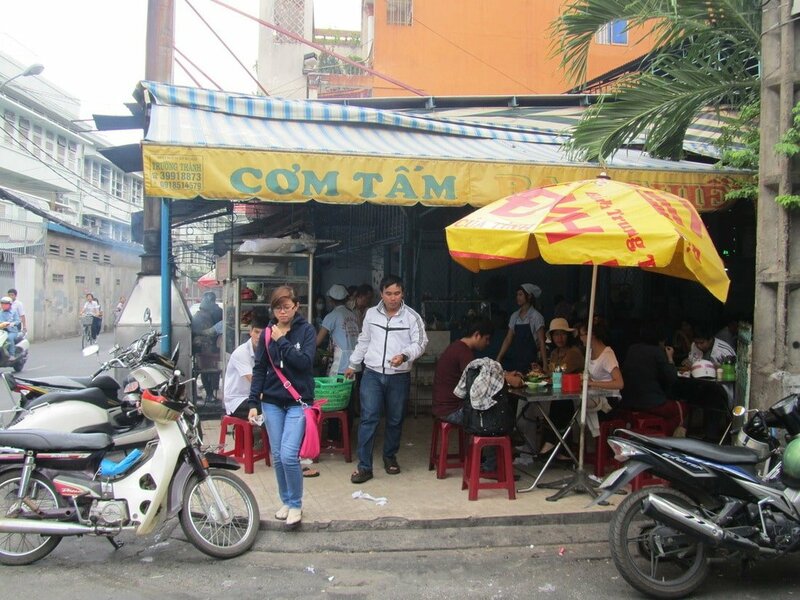 Local broken rice eateries can be found on practically every street in Vietnam’s cities. 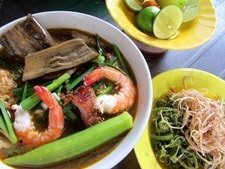 Although cơm tấm remains cheap and a staple among poorer Vietnamese it has also become a national favourite, spawning a number of ‘high-end’ cơm tấm restaurants. However, when it comes to quality and atmosphere there is no competition – the local street side places win hands-down. 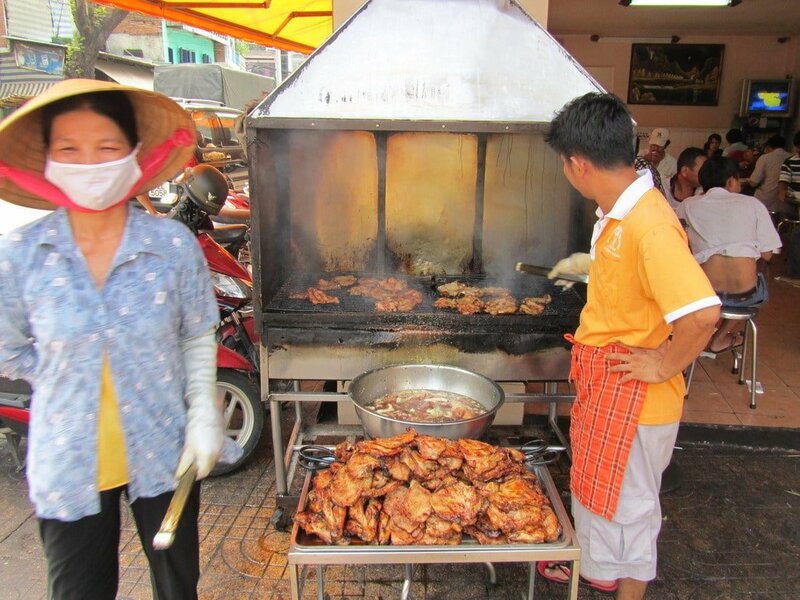 Local cơm tấm eateries are characterized by a coal-fired grill on the side of the street. When walking or driving in Vietnam you’ll likely smell one before you see it. 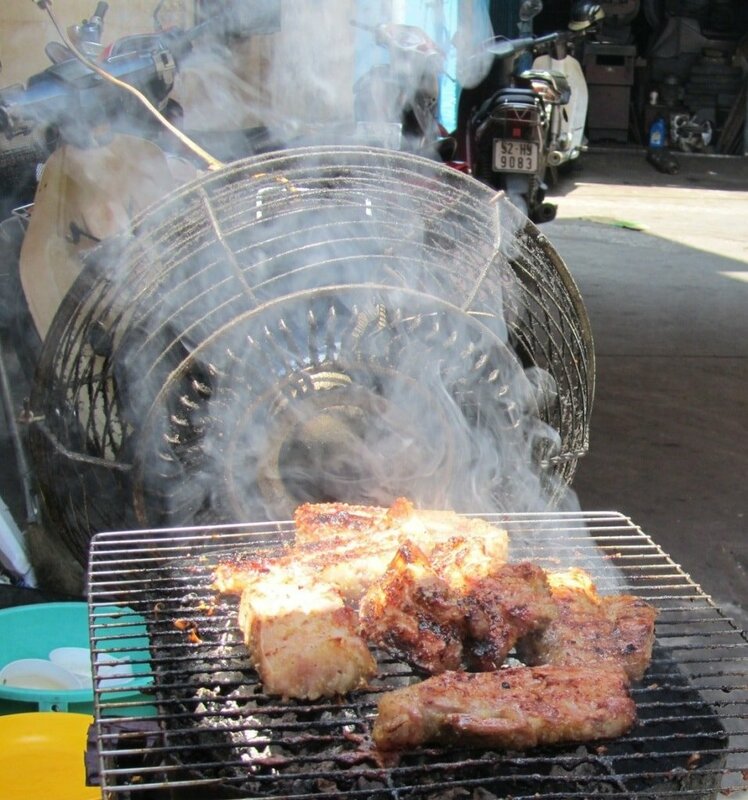 Scented smoke rises from pavements in towns and cities, driving hungry passers-by crazy with the aroma of lemongrass, sweet fish sauce and charred meat. 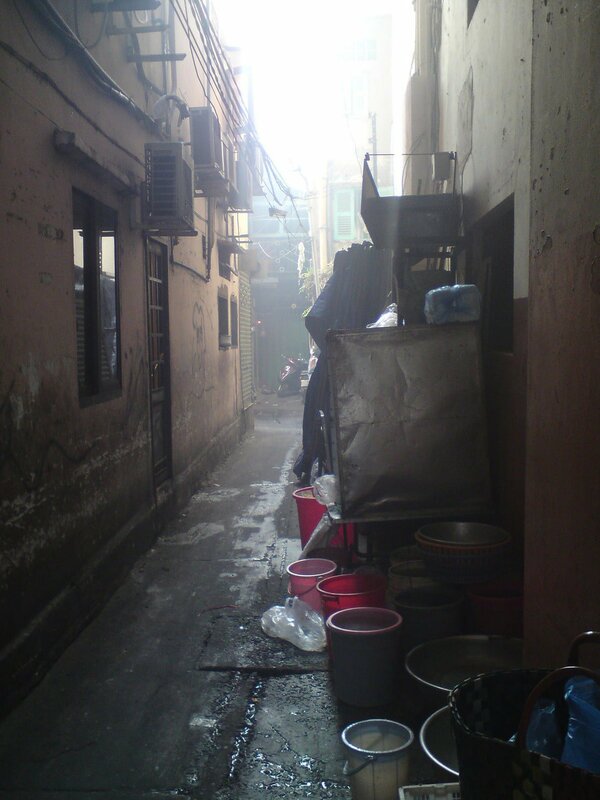 Follow the smoke and you’re bound to find pork and rice at the end of it. The eateries are very informal. Either there will be an open barbeque on the curbside with an aproned member of staff turning chops over an open flame, or a large aluminium enclosure sheltering the grill from the elements and a tall chimney directing the smoke away from customers and passing traffic. Small, low-rise red and blue plastic tables and chairs are the norm, but some successful spots are splashing out on new metallic stools and tables – mainly because they are easier to wipe clean. Don’t be put off by the mess! If you happen to arrive just after the morning or lunchtime rush there’ll be food-related detritus all over the pavement: spilt soup, discarded tissues, gnawed pork ribs, melting ice, toothpicks. If anything this probably indicates a good place to eat – the customers came, they ate, they enjoyed and they left. Good eating in Vietnam is often accompanied by a ‘good mess’. In my opinion, the bigger and more colourful the mosaic of debris on the floor the better the chances are of a good meal. Despite the mess your food will still be cooked to order within feet of your table – so close you’ll hear the sizzle of fat and juices from your chop as they fall onto the hot coals. Weather permitting, most cơm tấm eateries are al-fresco, but some offer indoor seating as well. Given the choice I always opt for dining in the open air. Part of the fun of street eating in Vietnam is people-watching and soaking up the atmosphere. 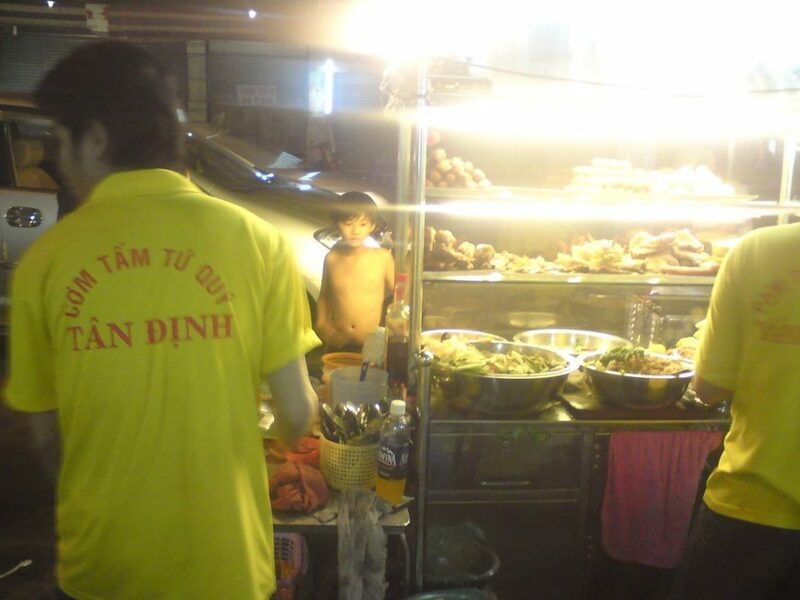 Feeling the heat of the sun on your forehead, the chili on your lips, the tang of lemongrass on your tongue, the exhaust fumes in your nostrils, and watching the family next to you feeding tiny morsels to their toddler – the full sensory assault – is a very Vietnamese experience. Many local places won’t have a menu. The big sign outside says cơm tấm, and that’s all Vietnamese customers need in order to know what’s available. Because the kitchen and customers are in plain sight it’s easy to ‘point-and-order’: either go up to the grill and point at what items you want on your plate, or take a look at what other people are eating before pointing to someone’s food to indicate what you would like. Prices vary considerably. Depending on the place and what you choose to have with your broken rice expect to pay between 20,000 – 60,000VND ($1 – $3). 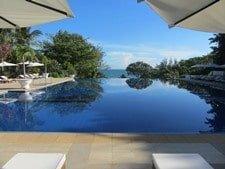 Unfortunately, it is still common for foreigners to be overcharged. In order to avoid a post-meal argument, that will ruin the experience, make sure to agree on a price before you eat. Note: Things change quickly in developing Vietnam. The following information is accurate at the time of writing, but some details are bound to be out-of-date by the time you read them. Please let me know of any changes, so I can update my posts. 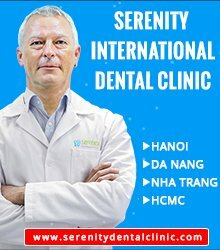 Here are some suggestions to get you started (all locations are in Saigon). However, cơm tấm establishments are so numerous that you’ll discover plenty of them on your own if you ‘follow the smoke’. Map: Hẻm (alley) 477 An Dương Vương, District 5 – This nameless eatery occupies a narrow alley with just a few tables jammed in. It serves giant chops and I love the dark urban setting. Breakfast only. Directly opposite is the large Cơm Tấm An Dương Vương (500-502 An Dương Vương) which is open all day. 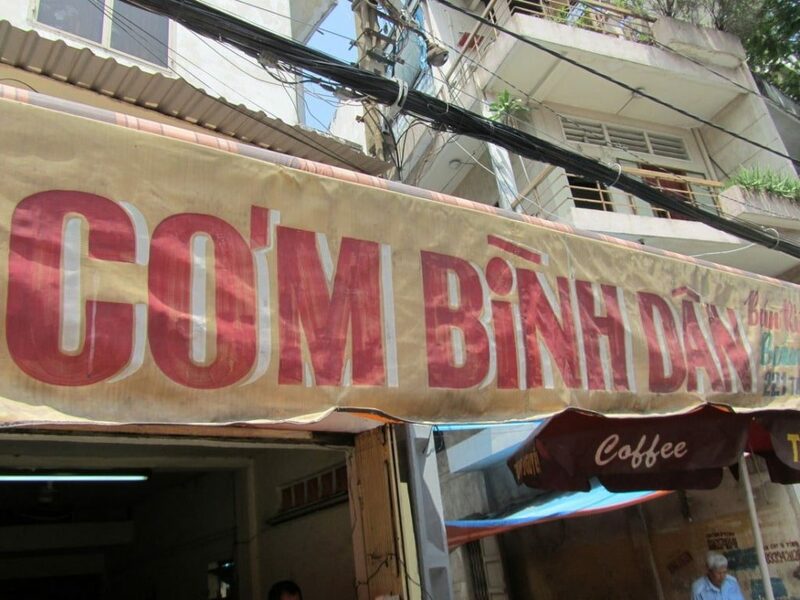 The latter is NOT where the label is on Google Maps – in fact it is right on the corner of An Dương Vương and Huỳnh Mẫn Đạt, on the opposite side of the street to the label. Follow my own marker on the map. Map: Cơm Tấm Ba Ghiền; 84 Đặng Văn Ngữ, District Phú Nhuận – Always busy at lunchtime, this popular place must make a killing, but, to their credit, they’ve resisted updating the decor: enjoy your food surrounded by ‘traditional’ peeling plaster and smoke-stained walls. Map: Cơm Tấm Tứ Qúy; Tân Định Market, Nguyễn Hữu Cầu, District 1 – Perfect for night owls, this place opens in the evening and stays open until the early hours. Well-organized, nicely presented and delicious. Map: Cơm Tấm Thành Râu, 119 Phùng Văn Cung, Phú Nhuận District – Particularly busy during the evenings, this place is a long established cơm tấm eatery. The portions are large and the food is great. What is it? Foreign food or local invention? Thịt kho tàu is pork stew. Belly pork is marinated in fish sauce and spices, then simmered in a pot with sugar (or coconut juice) until caramelized. The pot becomes a world of flavours – sweet, meaty and salty. Once cooked the belly pork is infused with the flavours from the pot and tenderized by the heat. The pork is either sliced thinly or chopped into big chunks with a large layer of fat at the top. Most westerners find the fat off-putting, but for me it is the highlight of the dish – the fat is so tender it almost ceases to have a texture; it melts on the tongue like an ice-cube in the sun. The meat is soft and tender too, but, compared to the fat, it is chewy, which makes for a satisfying contrast of textures. Any sauce that hasn’t already been absorbed into the meat can be poured over steamed rice – this is good enough to make a meal in itself. Apart from the meat there is usually another key ingredient in the stew. Depending on the cook and the region you might find tofu, sliced coconut, quail eggs, duck eggs or mushrooms, but most commonly boiled chicken eggs. Pork Stew – Chinese influence? The origins of this dish are a bit of a mystery. Many people assume it has its roots in Chinese cuisine. In Vietnamese, tàu means ‘boat’. Chinese immigrants in Vietnam are often referred to as Người Tàu – ‘boat people’ – just as Vietnamese immigrants were known in the Western world. Thịt kho tàu would therefore mean ‘boat people’s stew’ or ‘Chinese stew’. While this name pays homage to the foreign origins of the dish it is also mildly derogatory, as it reminds Chinese that having arrived by boat they are outsiders. Many Vietnamese instinctively whince upon hearing this name and prefer to call the dish simply, thịt kho – ‘meat stew’. However, some Vietnamese academics have researched the dish and found a different meaning for tàu, placing its origins in southern Vietnam and calling it ‘100% Vietnamese’. Another argument is that the common use of coconut juice to sweeten the stew means that it couldn’t possibly come from China, where coconuts were not readily available because of the colder climate. But similar pork stews do exist in China and Japan today, and it seems likely to me that at least some components of the dish came from abroad and were slowly ‘Vietnamized’ by making use of local ingredients and catering to local palates. Regardless of its origins, today thịt kho tàu is a national favourite – as common a sight as phở on Vietnam’s streets. 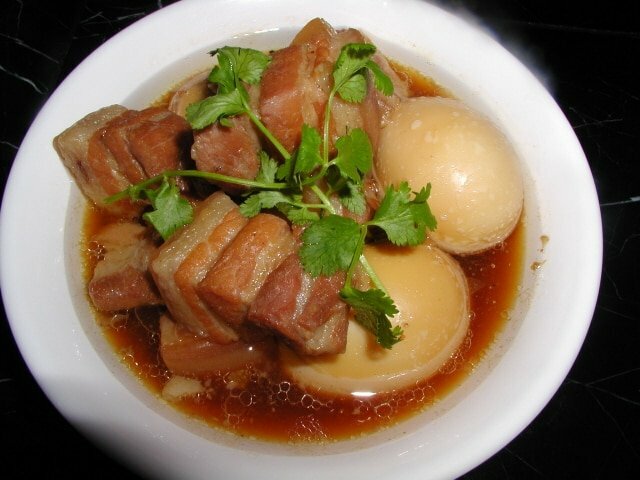 The sugary sweetness of thịt kho tàu is a very southern characteristic of Vietnamese cuisine. But the slow stewing and practicality of the dish (left for up to a week the stew continues to acquire more flavour) points to the north and China where the colder, harsher climate demanded food that would last. Perhaps the influence of north and south on this dish explains why it is available everywhere! 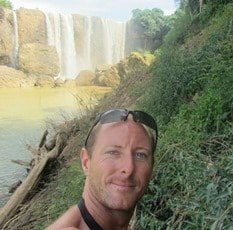 I am yet to visit a place in Vietnam where pork stew isn’t on the menu. Thịt kho tàu is typically found at street side local lunch eateries. 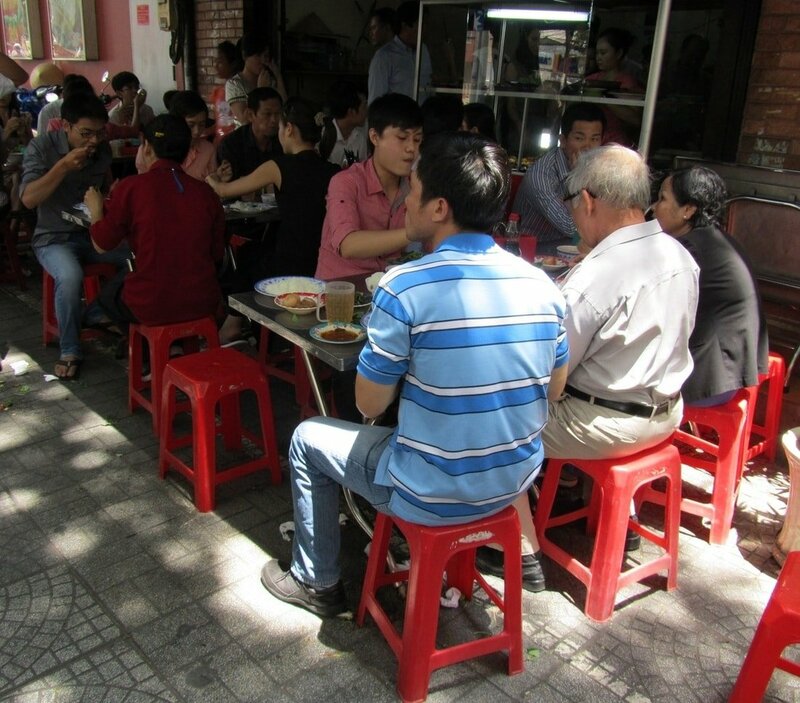 Look for the signs that say quán cơm bình dân, where food is displayed in trays behind a glass screen, like school dinners. To find a good place follow the crowds: on weekdays between 11:00am-12:30pm some places will be packed with workers on their lunch break. As always, look for lots of people and a good mess and you’ll likely find a good pork stew. 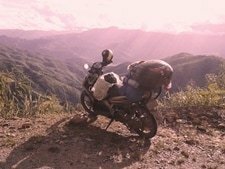 During my first year or two in Vietnam I became addicted to pork stew. Something in the sauce – perhaps the sugar, or was it MSG? – made my mouth water uncontrollably as I approached my local eating house. The fat on my tongue, the meat between my teeth, the sweetness of sauce-soaked rice in my throat, all washed down with an iced tea in the sunshine kept me coming back day after day. Ever since then thịt kho tàu is my ‘go-to’ meal in Vietnam. Pork stew is usually cheap. 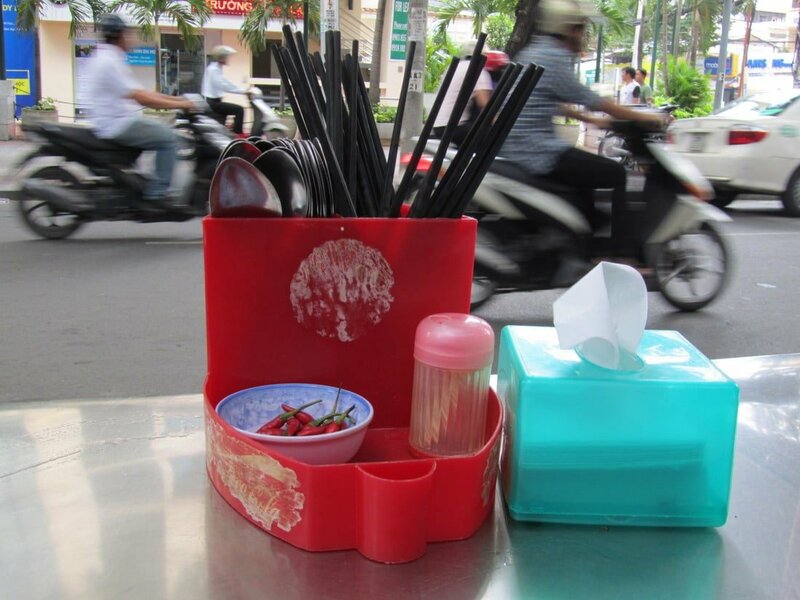 On the street it should be between 15,000 – 30,000VND ($0.75 – $1.50) with rice, a small soup and an iced tea. Ordering is easy – just point it out among the trays of food. Don’t expect it to be hot – these are quick lunches for busy people and everything is pre-cooked. You can find hot pork stew on the menu in most restaurants, but obviously be prepared to pay more. Map: Quán Cơm 17; 17 Mạc Đĩnh Chi, District 1 – while the smart food chains either side of this local eating house are always empty, by contrast Quán 17 is always pleasantly packed with food and customers, especially during the lunchtime rush. Map: Quán Cơm Minh Đức; 35 Tôn Thất Tùng, District 1 – a huge eating hall that inexplicably attracts a badly-dressed crowd – their taste in food, however, is spot-on! Map: Nhà Hàng Hoàng Yến; 148 Hai Bà Trưng, District 1 – for those who want to order thịt kho tàu off a menu, this restaurant will suffice – they even have tablecloths and napkins! This entry was posted in ALL, DESTINATIONS, FOOD & DRINK, Rice, Saigon, Street Food, The South and tagged broken rice, com suon, com tam, food, guide, Ho Chi Minh City, pork, Saigon, street food, Vietnam. Bookmark the permalink. Really great work Tom, made my mouth water and brought back some great memories when we used to drive around the city looking for some authentic street food places…ah Vietnam, miss that place! Well done fella! Good God! I thought I was craving a pint but all I want now is thịt kho tàu! You blighter!